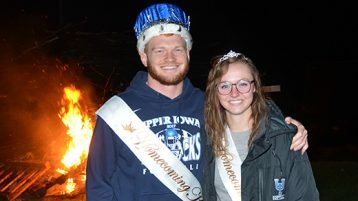 Tanner Thompson, a finance and accounting major, from Forest City, Iowa, and Sami Kay Shafranski, a biology major, from Stevens Point, Wisconsin, were named the "Peacock Pride Ignited...It's Lit" Homecoming King and Queen during the 2018 Upper Iowa University coronation ceremony in Fayette. The Homecoming Committee is currently seeking the input of alumni, faculty, staff, students and all friends of UIU in creating the 2019 Homecoming theme. The 2018 “Peacock Pride Ignited…It’s Lit” Homecoming continued Thursday (October 11) evening with the annual coronation ceremony and bonfire. Additional photos of Homecoming will be uploaded to the UIU Flickr page at www.flickr.com/photos/upperiowauniversity/ throughout the celebration. The 2018 Upper Iowa University Homecoming Court includes (front, l-r) Hannah Dotter, Bloomington, Minnesota; Hayley Cessna, Spring Valley, Illinois; Queen Sami Kay Shafranski, Stevens Point, Wisconsin; Lizzie Van Dyk, Des Moines, Iowa; Brandy Willingham, Chicago, Illinois; (back) Riley Braughton, Stanwood, Iowa; Parker Kray, Monticello, Iowa; King Tanner Thompson, Forest City, Iowa; Munachiso Okonkwo, Fayette, Iowa; Dane Gillespie, Fountain, Minnesota.